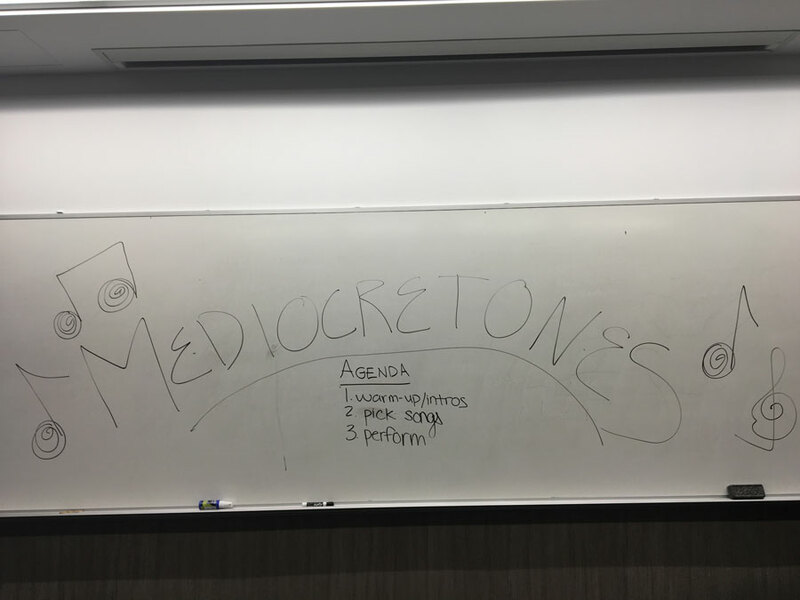 Medicretones is a new a cappella group on campus. The group held auditions in Kresge Hall for all those unable to sing. Sharpay Evans warm-ups and faint hummings of pop songs could be heard coming from Kresge Hall on Wednesday, as “Mediocretones” auditions began. The new a cappella organization welcomes a group who may struggle to find spots in other singing groups on campus: the untalented. Garnering an attendance of about 35 students, the “Mediocre A cappella” audition room buzzed with activity, as singers prepared their voices for the opportunity to prove their lack of ability. The preparations died down as Arzu Singh, began to speak. The singers were instructed to split into groups. Each group then chose a slip of paper, only then learning which song they would be singing for their audition. An emotional rendition of “Hello” by Adele came first, as three students belted out the words to the tune that would begin their a cappella careers. “Definitely bad enough to be here,” Singh decided. A 14-person group came next, gracing the room with their passionate performance of Avril Lavigne’s “Sk8er Boi,” followed by a rendition of “Kiss Me Thru the Phone” that had every auditionee clapping for their future aca-members. Singh said this was precisely the type of fun she had imagined for the group. She said the idea originated from a performance by a group of girls in a high school talent show who performed a version of “mediocre a cappella.” In fact, she had been joking about starting a group of this kind since her freshman year. Two years later, she is finally taking action. Singh is planning to organize three rehearsals before the group’s performance at the end of the quarter. SESP sophomore Bijal Mehta said the low commitment level of the group was a factor in her decision to audition. She also enjoys its stress-free attitude. McCormick freshman Priya Kini said she auditioned for the unusual opportunity to showcase her voice. Though Kini usually performs for an audience of just herself, she was excited to audition.